As the moon waxed towards full this weekend, I spent an evening at Elbow Falls to photograph the landscape at night. The clear air allowed stars to shine even with a relatively short exposure and small aperture (10 seconds and f/8.0, respectively). Always a bit lonely sitting out there for a couple of hours but the stars are really good company. The 6400 ISO and the bright moonlight allowed for some of the great details at this magical place in Kananaskis Country to show in the image. I am impressed with the improvements in the dSLR’s low-light capabilities over the last couple of years. A couple of years ago I spent another evening up at these falls. At that time I was using a Canon 1D Mark III and when compared with the image above and others where I used a 5D Mark III, the detail, structure of the noise and the color are all vastly improved. The technology is less and less of an obstacle to realizing the images I want to make. I like that a lot. This entry was posted on February 24, 2013 by Christopher Martin. 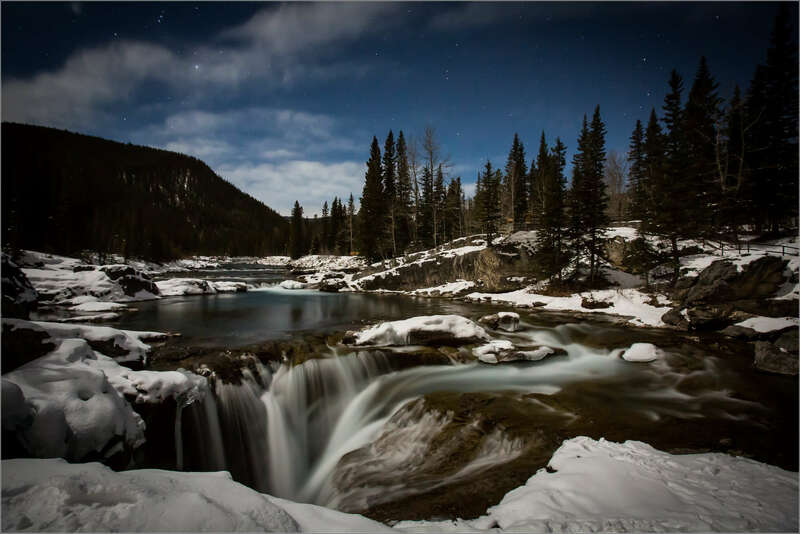 It was filed under Alberta, Kananaskis, Night Photography and was tagged with alberta, Elbow Falls, Kananaskis Country, landscape photography, moonlight, night photography, Rocky Mountains, stars, winter. So stunning! Thanks for sharing the details of how you took the photo. I took a photography class, but still have difficulty understanding exposure and aperture because my professor didn’t teach us anything, but told us to just go out and take photos. What an amazing night scene! I sure hope we get some more clear nights before the winter is out.